Today I will be talking about the costume of western, or Volynian Polissia, which includes the northern parts of Volyn, Rivne, and part of Zhytomyr oblasts, as well as southwestern Bielorus. 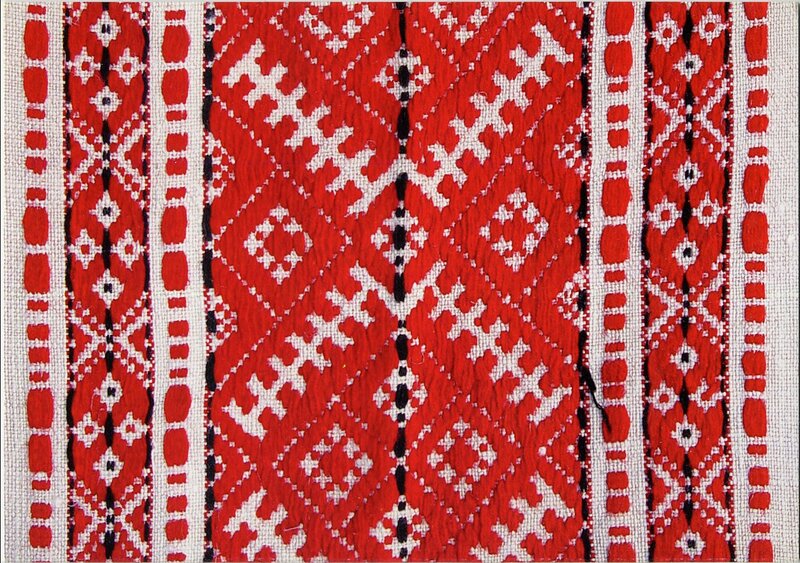 There is a style of embroidery practiced in the western part of Polissia, and not much elsewhere. In Ukrainian it is called Zavolikannia, Perevolikannia, Peretykannnia, Pidbyruvannia, and also other terms. 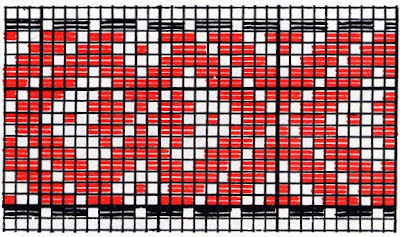 It is a type of darning stitch, like Nyz or Nyzynka. 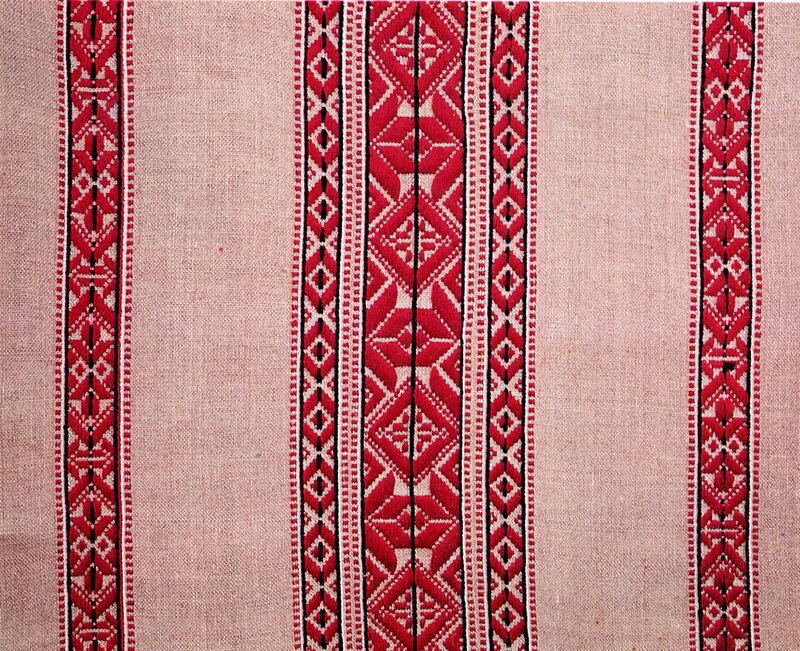 The distinction is that in Zavolikannia, the threads journey the length of the design, rather than across the width of the design, as in most types of darning stitch. Above is a modern Ukrainian man's shirt executed in this technique. I have been speaking of Polissia in several articles, It's about time i provided a map. Polissia is a cultural-physical region which follows the wetlands at the edge of the deep forest along the northern borders of Ukraine and beyond. Here is a map. The hatching shows the extent of Polissia beyond the current borders of Ukraine. A large portion of Bielorus is also part of Polissia [Palesie]. This is the only border of Ukraine where there is a gradual gradation of dialects to another language, from Ukrainian to Bielorussian. These two neighboring peoples share much history, and are closely related. 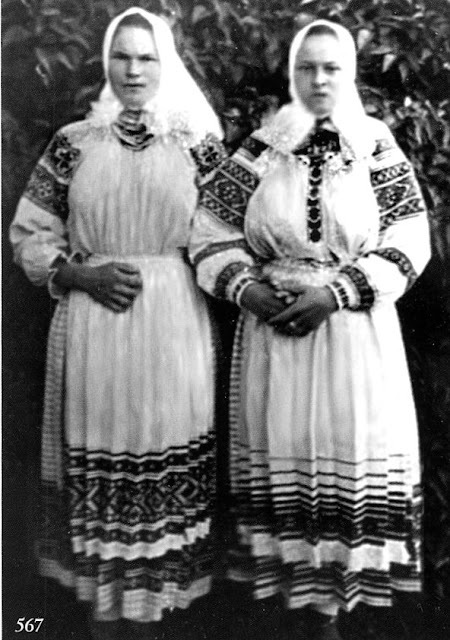 The Ukrainians and Russians moved into the steppe regions and encountered each other later, after their two languages had already diverged. There is a large Ukrainian population still in Bielorussian Polissia, especially in the west. Polissia extends somewhat into Poland, where they call it Podlasia. I have already done an article about the costume of that region. 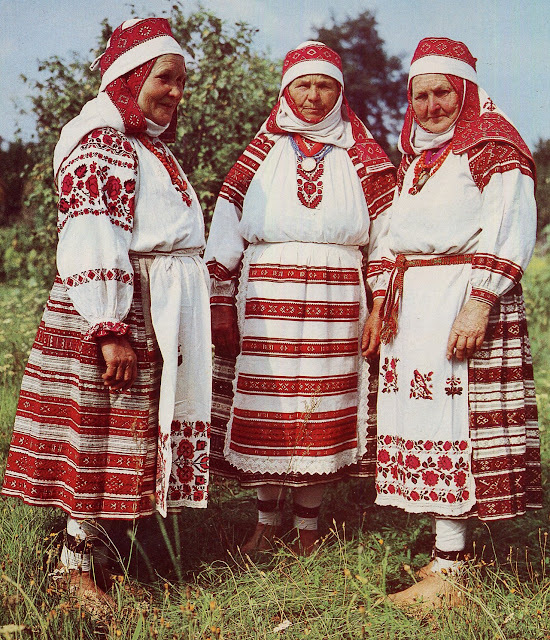 Much of the clothing native to this region is based on woven ornament, especially in the western part. Here are two photos of typical costume of the region. This one is from western Podillia on the Ukrainian side, typifiying the costume of northern Volyn' and Rivne Oblasts. And here is a photo of the costume of southwest Bielorus, which they call Zakhodne [western] Palessie. 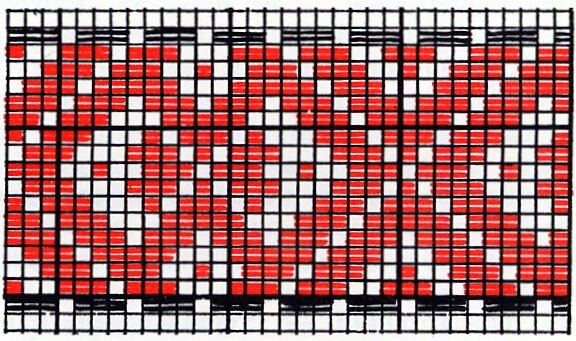 You can see that cross stitch has made inroads here, as most everywhere, but the major ornament is woven in red, with a small admixture of black, on a background of white linen, or white and unbleached linen woven in stripes or designs. Here is another example from the Ukrainian side. Here is an example from the Polish part of Polissia around Wlodowa [Volodova]. 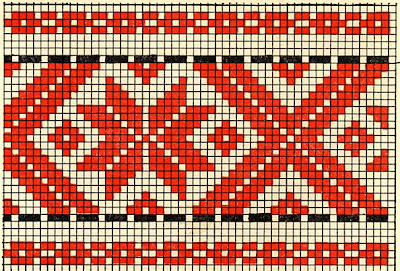 and another example from Bielarus, from Baratynichy, Kobryn region. 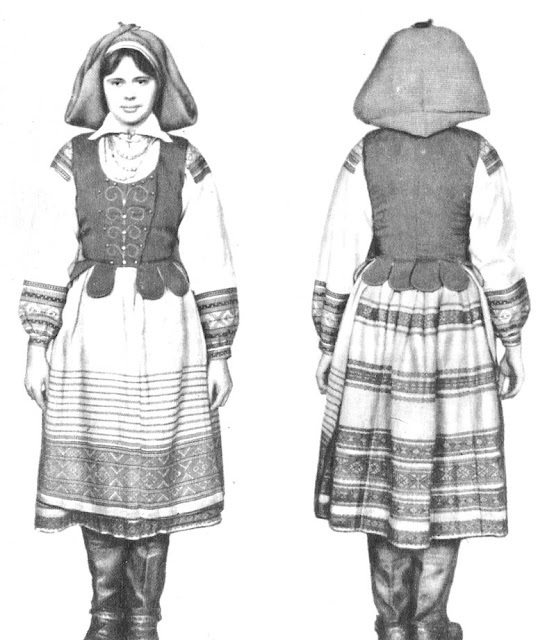 Taking a close look at this costume, the chemise, Sorochka has the standard Slavic cut with shoulder insets. 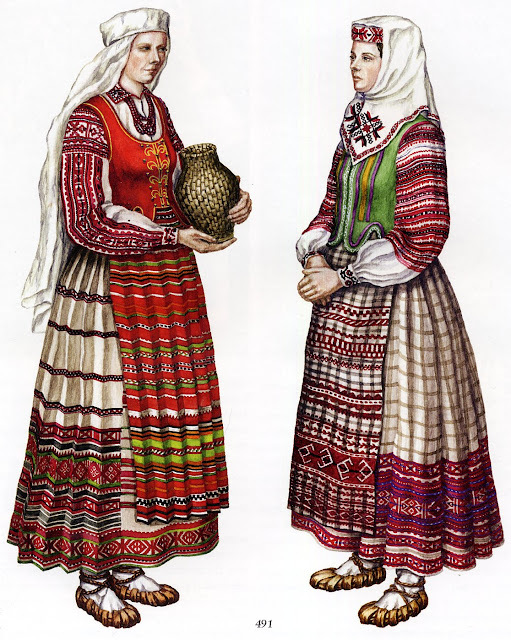 As you can see from the images, in western Polissia, there is no ornament on the bottom hem of the chemise, and it does not show beneath the skirt. 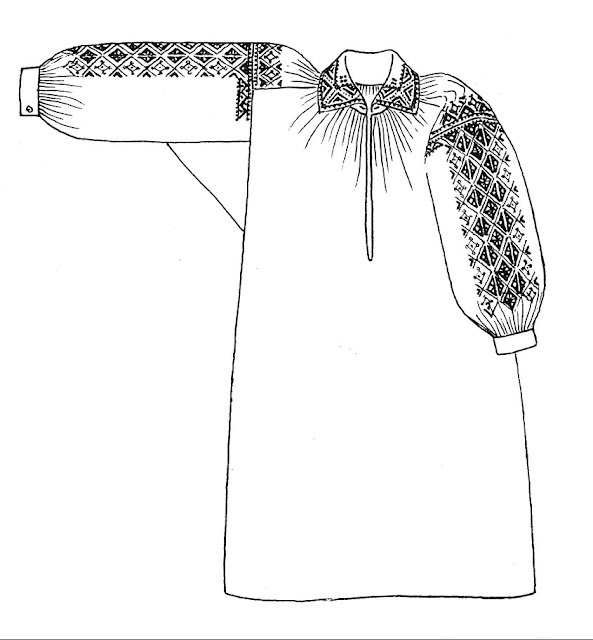 The shoulder inset has horizontal ornament, and the sleeve may have either horizontal or vertical ornament, and the placement and number of bands of ornament varies quite a bit. The collar often folds down, but band or stand-up collars are also known. 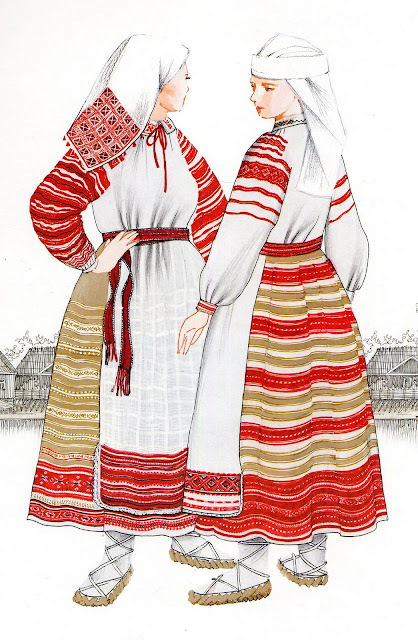 The linen skirt in this region is called 'fartuch', which in most places refers to the apron, and the apron is called 'perednyk' [front piece]. Here is a closeup photo of the back view of one of these skirts. 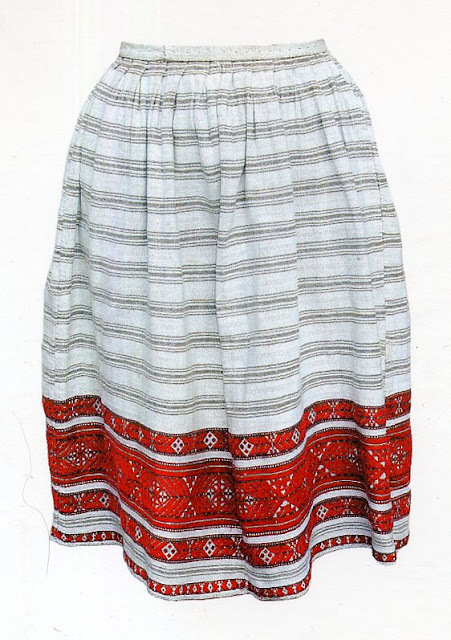 Here are closups of the woven ornament on the chemise and skirt shown above. The embroidery technique Zavolikannia is a straightforward attempt to copy this type of woven ornament. 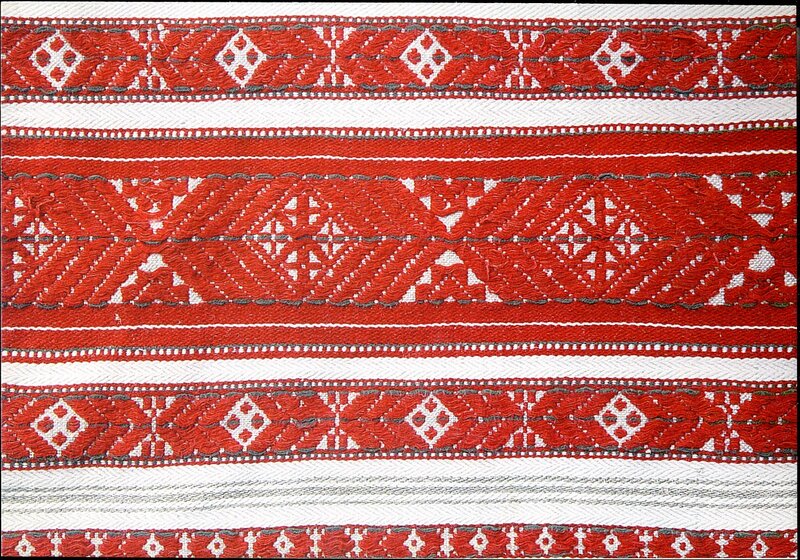 Any design embroidered in Zavolikannia may also be woven in pick-up. The needle imitates the shuttle. 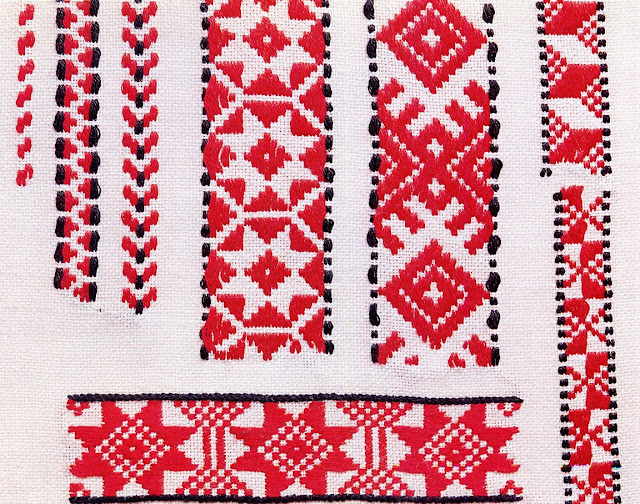 Sometimes it is difficult to tell if a piece is embroidered or woven. 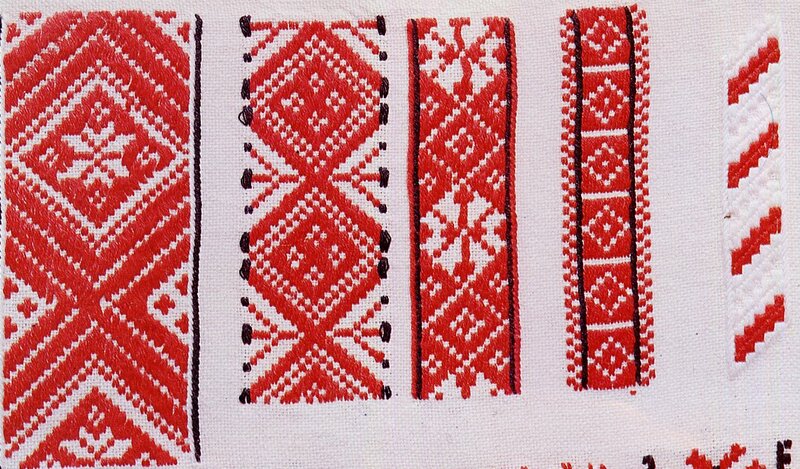 Here are some designs embroidered in Zavolikannia. The embroidery is done mostly in red, often with narrow black or blue edges and/or centers. The thread runs the length of the design and runs under and over an even number of threads. Most of the time, the next thread follows the exact same path, and then the third thread jumps two threads to make the next element of the design. Here is one way of graphing this kind of design. Each square on this graph represents two threads vertically and two threads horizontally. Of course, the back side shows an exact reverse of the design. Because there are two threads traveling the same path, there is a stepwise progression to the design, unlike the smooth diagonal lines of Nyz. Because of this, it is possible to graph these designs with squares. This has led some people to execute these designs in cross stitch. In my personal opinion, this should never be done, the designs seem to me to be obviously meant to be done in either pick-up weaving or Zavolikannia. 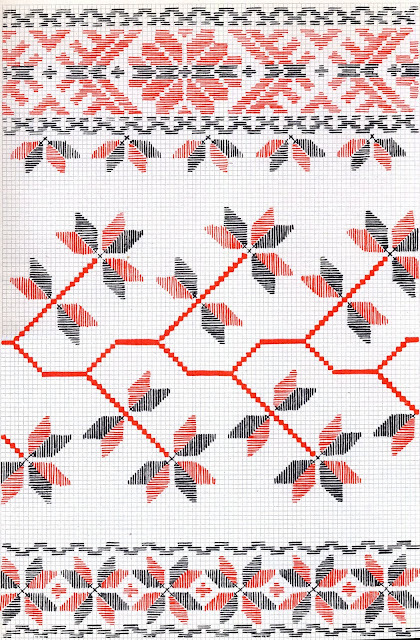 Just because a design is graphed in squares does not mean that it is meant to be done in cross-stitch. Just a few more examples of this technique. 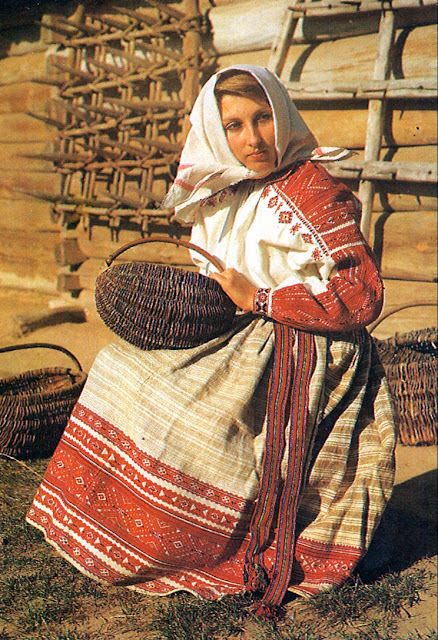 While this technique is most often found in western Polissia, examples can be found as far east as Kieven Polissia, where it is often combined with other embroidery techniques. Here are a few more examples of Zavolikannia designs. 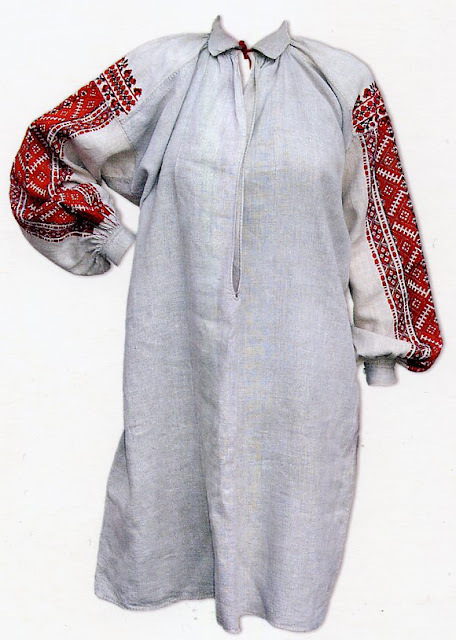 I will close with a couple of images of the costume of west Polissia. Thank you for reading. This is for Yulia Honcharova. Pryvit! I encourage all of you to try this embroidery technique, and bring a part of old Polissia into your homes. Fantastic post! So much detail. 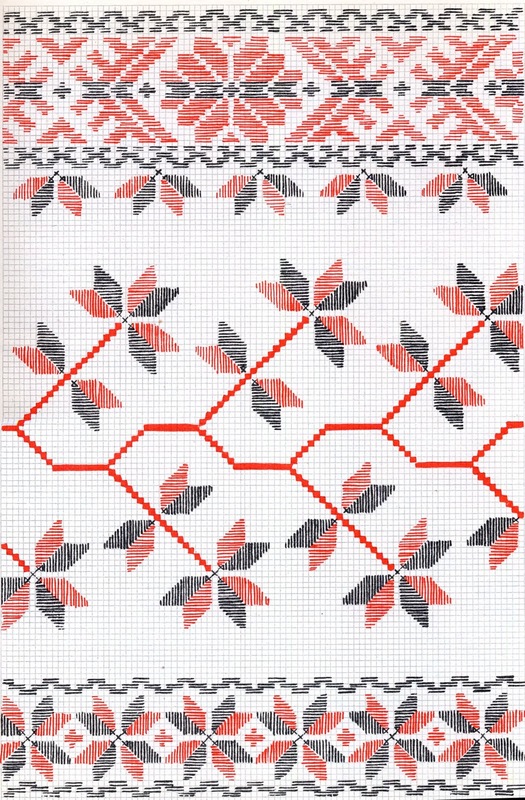 Agree that it certainly didn't have to be done in cross stitch, just because it was a two strand graph. 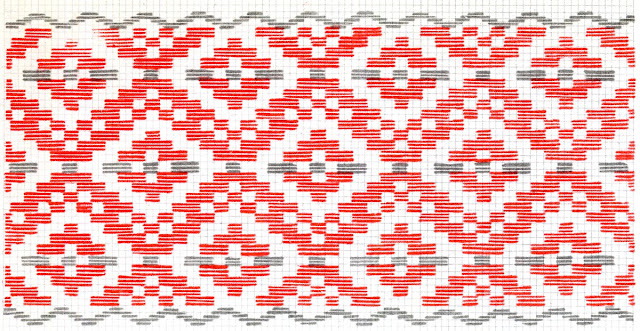 Roman do you have an actual "tutorial" to show how to do the Pick-up Weaving or Zavolikannia stitch? I looked everywhere but can't seem to find a basic how to.